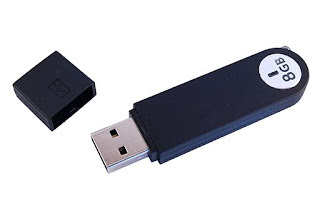 Many individuals prefer to have a PDF, E-File or some format to appear on which ever operating system they are using. Today, however, there are still many AQ 15 users of all different ages who want to have a physical manual to look up how something works in the program. This guide has step by step directions with accompanying screen shots to help the user follow the instructions and complete the task they looked up. Basics of Ancestral Quest makes up the first five chapters. For anyone new to the program it provides how to set up the program, how to work with different research strategies and features, printing reports and charts. 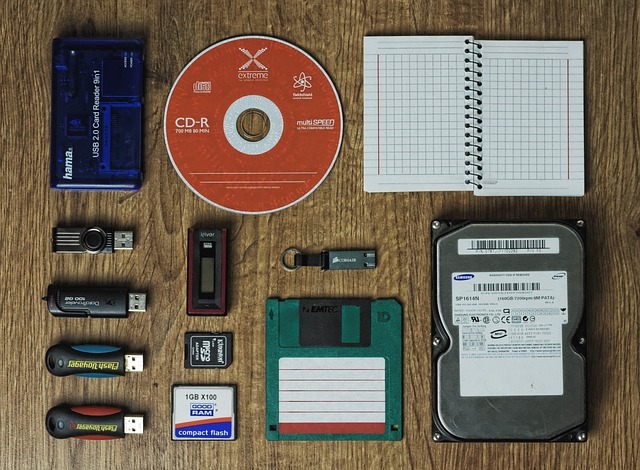 The advanced tools and uses sections takes up 17 chapters of tips, hints, collaboration tools, tweaking preferences and all of the powerful tools and features of the program. 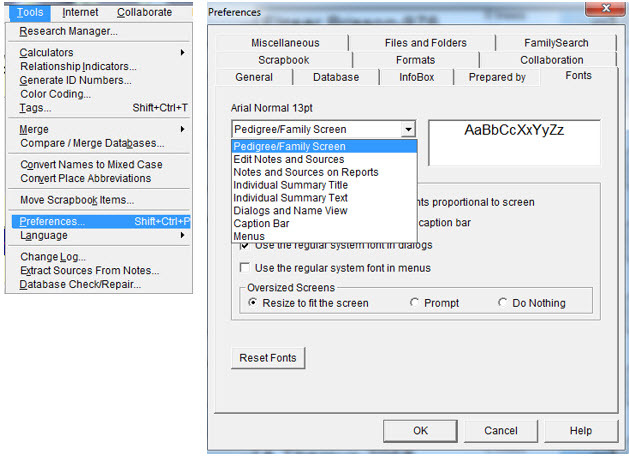 In the Appendices are several more helps like keyboard shortcuts to citing sources and others to help you make your research and data entry faster and easier. The PDF is 12.95 and is text searchable, the physical copy is 28.95 plus S/H. Take advantage of a great help to learning how to use Ancestral Quest even more! Click here to order it now. Once you get to this page, scroll down and choose whether you want the download or the physical book. 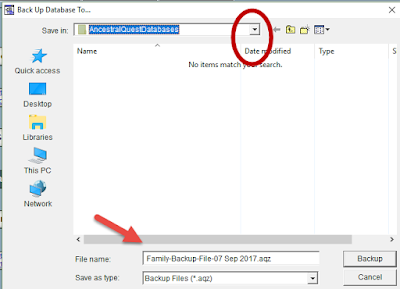 Enjoy this user guide and learn how to use Ancestral Quest even better! In today's world one has many choices because of technological improvements and designs. If you walk down an aisle in a grocery store, your selection of any particular item is vast and larger than in times past. Computer programs are the same, one can research and determine which particular program will be what is needed for the task. Each program will have unique features as well as standard ones. 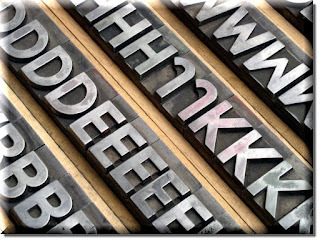 The same goes with the fonts we use for various tasks. You may wish to type a letter in one font but use a different one if you are designing something special. In Ancestral Quest there are multiple charts as well as the entering screens, notes, sources, etc. One can change these fonts to make them larger, smaller or a different style depending on the need. 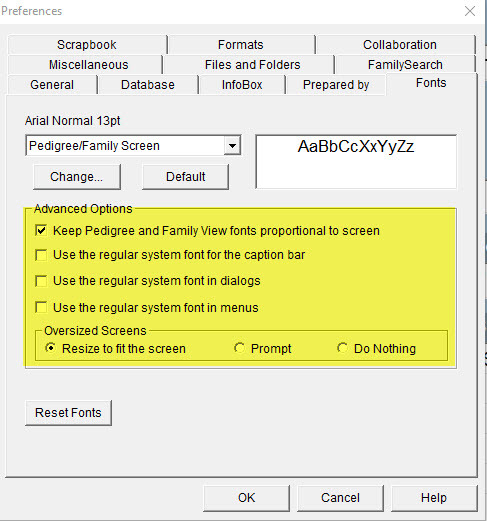 To do this you simply click on "Tool" then "Preferences", once that window is open click on the tab "Fonts". Once there, you'll be clicking on the drop down as seen above. 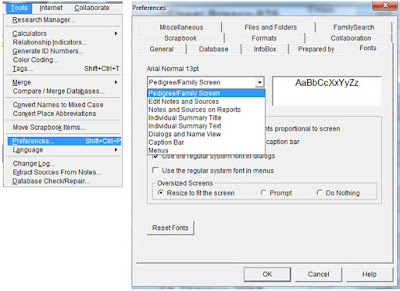 This is where you can change a font for a specific section as well as the size of that font. Once you click "OK" the font will be changed. Sometimes individuals need larger print or even smaller print. All of that is done in this area. 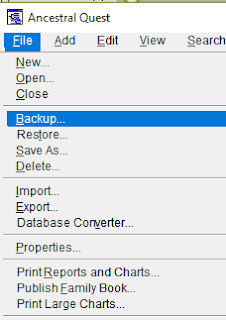 If you decide you want it back the way it was, simply click on "Reset fonts" and that will bring everything back to the way it was in the beginning. Enjoy this feature and others in Ancestral Quest 15! 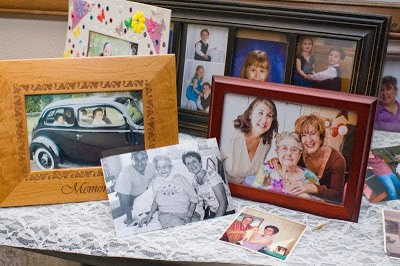 One of the key features for various genealogical software is the ability to record all types of events connected with individuals throughout their lives. For many there are Christenings or Baptisms, Confirmations, and other events which are important factors connected with a specific religious affiliations. Ancestral Quest has the ability to add all of the various events including the ones connected with temples in the Latter-day Saint faith. In the red box, check these items shown in the red box above: 1) Use LDS Data 2) Show on Reports 3) Ordinance Codes on Child List and 4) Connect with FamilySearch. Now click OK , this is the first step. The next step will turn on the Temple Icons. From the main screen click on FamilySearch, scroll down and click on Ordinance Reservation and Tracking System, if you have no logged in, it will prompt you to do that, once you have successfully entered your login information you'll be brought another box with 5 buttons, one of them will be "Show Temple Icons". Click on the "Show Temple Icons" and this will close and your temple icons will be there. 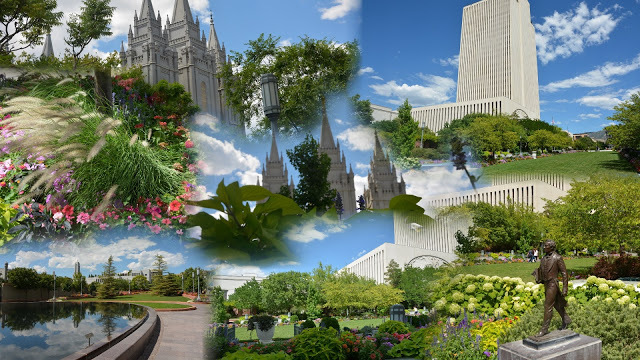 Once you've followed the above steps you will have turned on the LDS features within this program. You will note there are other buttons there to assist you these features. Enjoy this and all the features in Ancestral Quest 15! There are many events in our lives that are not on a simple family group record, if one wants to record those important events you have some choices of how and where you want to do complete that task. So much happens to us from the time we are born, it would be impossible to have one form to cover it all. From the first day at school to purchasing your first car and entering college, there is much to share with our family, friends and descendants when that time is here. Note the "Other Events" is there with the main events in a person's life, one simply clicks on the "Add" button to choose which event you wish to document for that person. Here are the choices, the list is long and you can add your own event if it is not listed here. At this point, you can use the scrolling bar, highlight it and click on 'Select' or click on 'Add Type' if what you need is not in this list. 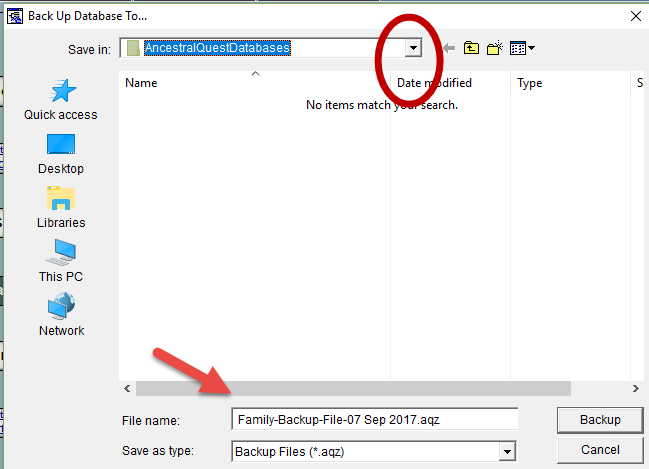 With the event selected, you simply enter the information in the form and click add and it will populate the lower section of that ancestor's individual record like this. At this point, you can close the 'Edit Individual' box or add more events. These events can be in date order using the arrows on the right. When finished, click on 'Save' and close this individuals edit screen. If you run a report this additional information will be included. This is a great feature and allows one to add many of the wonderful events that happen in one's lifetime. Enjoy this and all the features in Ancestral Quest 15.